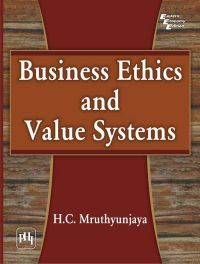 This comprehensive and well-organised book deals with some of the basic issues associated with business ethics and value systems. It presents the views of different schools of thought on this subject and dissects the phenomenon of corruption to expose its root causes. The book provides a critical analysis of this social epidemic that forces corporates to become corrupt and remain unethical. Besides, it describes a few popular ethical theories, some of the key issues that affect ethical decision process and the role of total quality management in ensuring practice of good workplace ethics. Primarily intended for the postgraduate students of management and commerce, the book can also be used beneficially by practicing professionals. • Presents more than forty live cases that show a cross-section view of different types of unethical practices. • Gives model ethical codes for a few professions. • Provides spreadsheets to enable satisfactory compliance with legal and statutory requirements. H.C. MRUTHYUNJAYA, PhD (IISc, Bangalore) is a Consultant (Corporate Systems) serving various organizations. Elected as a Life Member of Indian Academy of Wood Science, Dr. Mruthyunjaya was formerly a research scientist in Indian Institute of Science (IISc), Bangalore. He has over 35 years of professional experience in the fields of R&D, technology and knowledge management. He has authored two books in the fields of R&D and quality management. Dr. Mruthyunjaya has also authored over 50 review articles in various fields of Quality Management and Business Management including invitation articles on Technology Management and Knowledge Management.